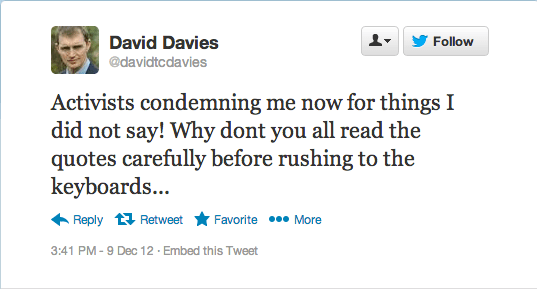 Not meaning to upset Davies’ delicate sensibilities, but your bits don’t know if you’re gay or not when you make babies. If they did, I wouldn’t have four stepchildren. Of course! How foolish of us to misinterpret statements like “most parents would prefer their children not to be gay” as meaning, well, that most parents would prefer their children not to be gay. 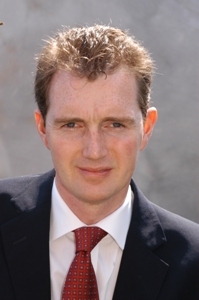 Davies then attempted to demonstrate either his egalitarianism or his half-naked non-gay body by posting a YouTube video of his boxing match with an actual homosexual. So he must really love gay people…because he once punched one of us? Personally, I want to see Davies’ views on a placard – “NO GAY MARRIAGE BECAUSE GAY BABIES” has a nice absurdist ring to it, I think.